Discover the history of this opulent building, originally built between in 1779 and designed by the 5th Duke of Devonshire. It was once the largest unsupported Dome in the world, even beating the famous Pantheon Dome and St Peter’s Dome in Italy. However, the Devonshire Dome still remains the largest unsupported Dome in Europe! In the Dome you will find a restaurant, a café, hairdressers and beauty services, a spa, plus it makes a beautiful wedding venue. For any queries, you can contact them on their phone number: 01298 330620. Roughly 1 million people visit the gardens every year to enjoy the beautiful scenery, serene surroundings, choice of playgrounds for various ages and the duck ponds! The river Wye winds elegantly through the gardens, with shallow areas for paddling, and opens up into a few different duck ponds, so take some seed with you to feed them! Next to the café there is a tropical greenhouse, where you can see exotic plants and trees and a fish pond, proving popular with both adults and kids! Other features in the park include the newly built playgrounds, one for young children and one for all ages. Near the larger playground there is a kiosk where you can buy refreshments such as teas, coffees, fizzy drinks and snacks. There are also toilet facilities around the corner. Little kids will adore the miniature train which goes around the centre of the gardens past the duck ponds. Remember to wave to the driver! During your stay in Buxton, why not experience fine-dining in the Dome’s restaurant? The restaurant is catered by the students who are training at the University and are supervised by professional head chefs at all time, so the food is of a high quality and comes with a low price tag, which is always a bonus! What’s more, the menu changes regularly to make the most of the local produce which is available, meaning you will truly experience the taste of the Peak District. After enjoying a nice meal, why not unwind and forget your troubles with the Dome’s spa services. The range of massages, scrub treatments and body wraps will leave you energised, detoxed and relaxed, and able to completely forget the daily stress of our modern world. The Bespoke massages are well priced, costing £40 for 30 minutes, £65 for 60 minutes, and £80 for 90 minutes and are carried out by professionals. The spa is open every day except Mondays from 9am, (from 10am on Sundays) and close between 7pm-8pm. Treat yourself with in the salon in the Devonshire Dome! Whether you are looking for a one-time makeover for a special occasion, or simply want to feel pampered, the full beauty programme will not disappoint. The prices are comparatively cheap, especially if you choose to have a training student do the treatment. The hairdressers offer haircuts for both ladies and gentlemen starting from £6, blow dry and cut from £6, hair dying from £12 and perms from £15. The spa also offers nail beauty treatments, including manicures, hand masks, pedicures and gels. You can also try the range of face care on offer, such as eyebrow shaping, tinting and a MAC Makeup makeover. The Dome also has waxing services, which are much cheaper than the average prices for the same treatments in other establishments. The spa services are available Thursdays, Fridays and Saturdays between 10am to 5pm. Finally, to end the day on a relaxed note, make the most of the range of massages that the Devonshire Dome has to offer, including a full body massage, a hot stone massage and an Indian head massage. The Devonshire Dome also hosts events, so make sure to check on their website regularly so as not to miss anything! Previous events include art shows and art and design fairs, where you can see artworks and creations from local artists. These events have proved very popular in the past, and the artists are friendly and always willing to talk with the attendees about their pieces. In July, you can watch the spectacular Buxton Military Tattoo perform in the Dome, which has sold out every year since it started, so make sure to book and save your space. More alternative events include the Philosopher’s Dome, which I perfect for fans of Harry Potter. Attendees can choose their house, chat with actors from the film franchise, take pictures with people in costume, watch owls fly, explore the Harry Potter market place and listen to guest talks. 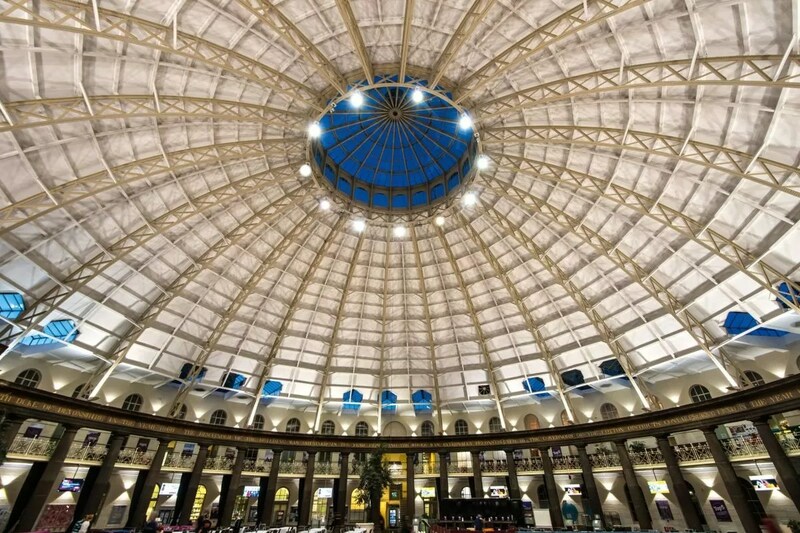 The Devonshire Dome is also the home of Buxton’s one and only comiccon, named Unicon! There you can see guest talks from your favourite actors, get their signatures, dress up in costume and take pictures with other people, enter cosplay competitions, and much more. There are also up to 50 seller tables, where you can buy unique merchandise that you just don’t see anywhere else. These events are just some of what goes on in the Dome, so keep an eye out for what’s going on so you don’t miss anything. This illustrious building coupled with the stunning views of the Peak District make the Devonshire Dome the perfect place for a Wedding venue. Make your special day perfect with the team at the Dome, who tailor the day to what you want to achieve your dream wedding, rather than following a script or a set package deal. The menus have been designed to suit all tastes and are cooked by an award-winning chef. However, the menu can also be altered to your tastes if you please.